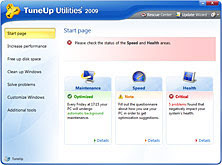 Today's giveaway is TuneUp Utilities 2009, delivering comprehensive, simple and fast PC optimization, used easily by even novice computer users - one retail box version, which can be used on up to three computers - value $50.00. As soon as I set up the TuneUp Utilities software into my laptop, it told me about three network problems that was leaving me open to hackers, and I was able to fix all three problems with just one click. Next it suggested I do an analysis of my system - I could choose from Normal, which will check my system for errors and Thorough, which will also locate any bad sectors & recover any readable info. Let's start with Normal... Well, that took just three minutes and found no errors! OK, next it wanted me to check & optimize my speed... A quick questionnaire and it came up with 23 recommendations. It will speed up my online searches, speed up my load time and my start up menu, as well as optimizes my performance. Next I thought I would clean up any unnecessary disk files... It found 681 unnecessary files and backups. Cleaning that up gained me 15.59 GBs. Wow! Next let's check the TuneUp Disk Space Explorer... Interesting to see where my storage is going! I love how easy it is to fix, clean or correct each problem. In his temporary files, he was able to free up 39 MB of space - so not as bad as mine! He thought it was a great tool for a novice computer user. 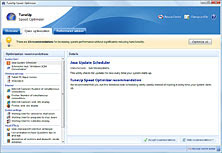 TuneUp Utilities 2009, the latest version of TuneUp’s award-winning series of PC optimization software, provides Windows users, whether novice or expert, with a comprehensive suite of maintenance tools to ensure their computers remain healthy and fast. The software supports Windows XP and Windows Vista (both 32- and 64-bit versions) and automatically adapts its functions for the respective operating system. Unlike conventional tuning tools that only offer static optimization techniques, TuneUp Utilities 2009 takes an intelligent approach, analyzing the configuration of individual PCs to determine the best tuning measures to perform based on the user’s specific requirements. In the latest version, the developers have focused on making it possible for users to optimize PCs with minimal effort, while maintaining complete control over any system interventions. TuneUp Utilities vs. System Mechanic - Frank Ohlhorst, Executive Technology Editor at eWeek and Channel Insider, does a full comparison test between TuneUp Utilities 2009 and System Mechanic to find out which one is better for fixing PC performance issues. Check out their new TuneUp Blog! Surf through great tips and tricks for optimizing, streamlining and troubleshooting Windows! To enter to win this TuneUp Utilities 2009, please leave a comment telling us how many errors you think it will find on your computer? "Frugal-Freebies.com is having a great TuneUp Utilities 2009 giveaway! Stop by before midnight Sept 20th EST to enter to win! " Two weeks from posting. This giveaway ends on Sept 20/09. I will e-mail the winner, and results are always posted here on the following Monday as well. If the winner doesn't respond within four business days, with contact details, a new winner will be drawn. I would probably find a couple hundred errors! I actually have this site in my bookmark menu, so that is how I found out about this giveaway. I'm following your info on Facebook. Thats how I found out about this giveaway. It would probably find a million errors on my computer. Since I haven't done any kind of tune up in a year I'm guessing at least 3 hundred error messages wil pop up. Received an email from Blogsweeps.com to find out about this contest. found on a twitter post. I think I need this because there are programs running that I know nothing about. I'd probably find a few as I run utilities frequently. now if they could just tune me up I'd be happy! Always nice to be able to house clean your computer the safe way. I would have to say several hundred. I would like to be able to clean and optimize my own computer. Might have a hundred or so. It would probaly find a lot of errors because there are a number of strange programs running in this computer. It would find a couple thousand errors. My computer is really slow. sadly, i'd expect to find over 100 errors. but finding them will hopefully free up some space and make it run faster! I found out about this contest from your Frugal Freebies site. Jumped in from Prizey for another contest. I recently checked my computer using a free program and it listed about 600 errors. The program would repair the errors if I purchased additional software. Since I did not purchased any additional software, I know I need to win this. contestgirl told me about this! A nice way to clean out my computer without hassle. I found this on online sweepstakes.com. Useful for speeding things up after a cleanup. I could use a good computer clean up. How many errors? Yikes, alot I'm sure. I enter tons of sweeps. I think it will find 35 errors on my system! I found this on OLS. You betcha there will be lots of errors it might find! I think it would find about a hundred problems on my computer. I found out about this giveaway on another website. I would bet there would be upward of 150 or so. Oh my goodness. My computer is an absolute nightmare. All I know is that there are many many things wrong with it. Hundreds no doubt. 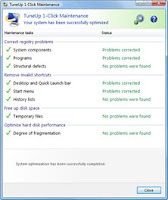 My computer is rather new, so I suppose the TuneUp Utilities would find some errors, but hopefully not too many. It would be a great product to keep my computer running smoothly in the future. This could help to ease my computer crashing problem. Lots and lots and lots. Sigh. I consider myself careless and reckless when surfing. It would find a multitude of errors. Please accept my entry. Thank you. My laptop is NOT the fastest by any means ! It needs some help! This would help me keep my computer in top form. I know TuneUp Utilities will find loads of errors on my old hound of a computer. I believe the computer would run faster and better after I let TuneUp Utilities do it's cleanup on my system. quite a bit..my computer has been kind of slow and random.. I found this giveaway at Sweetie Sweeps. I could use the Tune Up Utilities software. Would sure help to keep out the Bad guys! I think it will find at least a hundred errors! This product would help keep my computer clean and healthy. I know I would find too many errors on my computer. My computer has been acting up a lot lately so I am sure this programwill find a ton of errors. I could really use it. I bet their is so many it really would be hard to say but my guess is going to be about 369 if not more. I try to disk clean nightly but that doesn't get all those hidden problems. This program would probably find a lot of errors on my computer as it's a hand-me down. I found this giveaway on Sweeties Sweeps. Embarrassed to say probably 25. Between this computer and my daughters,I would have to say ay least a couple hundred. Probably 200 - 250 errors. I'll let you know whe I run the copy I win! I would like to be able to clean and.configure periodically. I think it would find at least three errors. I'd find over 100 errors for sure. My sister emailed me about this giveaway. I shudder to think, but likely 150 errors on mine. I wouldn't be surprised if it found 100+ errors. ugh. I would love to get my computer running much better! I think it would be around fifty errors that this software could find on my computer. I will say probably at least 100 errors. My computer could sure use this stat. This should help me a lot, it will find tons of errors since my computer is so slow these days. about a million? My computer has been terrible lately. Id love to not have to replace it! I know I have plenty of errors on my computer probably to many to count. Thanks for a great giveaway. I found out about this site and this opportunity on Casnet Sweepstakes. I think it would find 10 errors. Thanks for the wonderful giveaway. I don't think I could even count how many errors my computer has. There are sooo many things! I would be thrilled if my computer actually ran smoothly again! I get so frustrated when it crashes! I would at least find 50 errors I bet. This product would be very useful. My kids keep my PC full of nasties! Our computer has been running slowly lately, so I'm hoping it could find 10-20 errors so it can wipe our computer clean! It would probably find a few hundred. I think I should only have a few because I just got it cleaned up a couple of months ago. But I would like to keep it that way. My good freind told me about this, and boy do i need it! I couldn't guess how many errors it would find on my pc. I am relatively amature on the computer so it would probably find hundreds or thousands. Probably a couple hundred as well...ICK!! it would find at least 50. It would probably find about a thousand. I heard about this giveaway on Sweepstakes Advantage. I think it would find about 15 errors, I try to keep my computer updated, but there always seems to be something new trying to sneak it's way in.